95. How many people are in your household? other people if they now live with you, you provide more than half of their support and you will continue to provide more than half of their support between July 1, 2019 and June 30, 2020. 96. How many people in your (and your spouse’s) household (from question 95) will be college students between July 1, 2019 and June 30, 2020? Always count yourself as a college student. Do not include family members who are in U.S. military service academies. Include others only if they will attend, at least half-time in 2019-2020, a program that leads to a college degree or certificate. Questions in this group will inquire about who specifically resides in your own household / home. 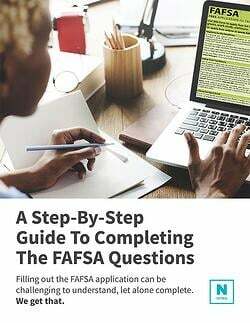 In this section, you will also be asked to clarify which of the people who reside in your household/home are or will currently attend either college or a degree seeking program in the upcoming academic year. You will want to list the number of people living in your household/home, beginning with yourself, and any other siblings or relatives for whom your parent(s) pay for 50% or more of their financial support. You do not want to include your parents in this section, even if they are in college or a degree-seeking program. Adults who have already earned a degree, are in graduate or professional programs, or who are over the age of 24 will not be counted as being in college at the same time as you (even if your parents are helping to pay their educational costs).